Gulfstream Aerospace’s long-range, large-cabin G500 continues to advance toward anticipated FAA certification next year. As first reported in AIN, the new twinjet is also getting more cabin windows: the prototype aircraft had 12, but Gulfstream is increasing this to 14 on production aircraft. 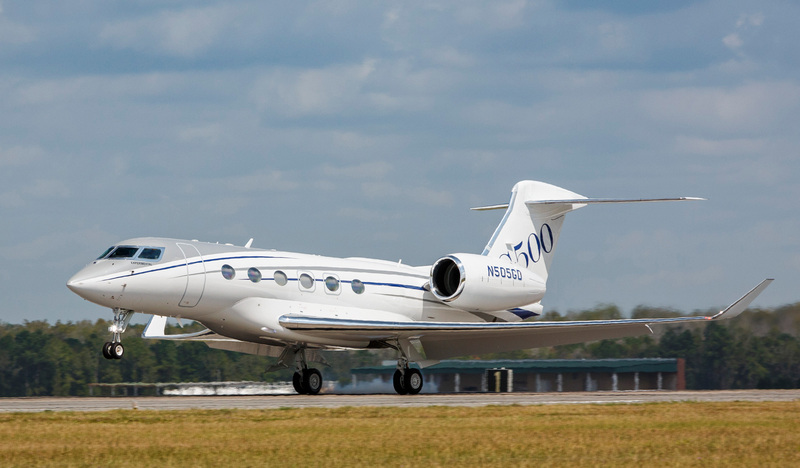 Through mid-September, five flight-test G500s have logged 1,507 hours over 361 flights, achieving a maximum speed just below the sound barrier at Mach 0.995 and flying to a maximum altitude of 53,000 feet. This testing included a successful crossing of the Atlantic and a long-endurance flight of 8 hours 24 minutes. A variety of ground-based extreme temperature chamber and crosswind tests were also completed at Eglin Air Force Base in Florida. Besides the four prototypes and one production aircraft with a complete interior that are currently flying, Gulfstream has conducted more than 53,000 hours of testing in the systems integration bench, integration test facility and “iron bird.”Human factors testing of the Symmetry flight deck, including validation of the pilots’ ability to use the G500’s touchscreen Honeywell Primus Epic avionics in turbulence, has been completed with the FAA and EASA in the integrated test facility and a FlightSafety International simulator. Gulfstream formally announced the Mach 0.925, 5,000-nm twinjet in October 2014 and flew the first test G500 in May 2015. Its larger sibling, the G600, is expected to make its maiden flight by year-end.